This cannabis seed is a stable cross between a Secret Project No.1 and a K.C.33® dominated by indica genes. Her behaviour is not much different from any other indicas – a SPONTANICA® Feminized seed produces bushy plants with dark green leaves which dress beautifully her thin sturdy stem. The leave to bud ratio is so well balanced that both have enough place and light to fully develop. What makes SPONTANICA® Feminized different from any other marijuana varieties is her ability to produce extremely tall plants; some outdoor ones can grow as high as 4.5 m. No surprise, that with such a great height we should expect a high yield. And she doesn’t disappoint us – outside yield is amazingly high and make as much as 900 gr. per plant! Indoor varieties keep their indica characteristics and remain as short as just 150 cm, still with quiet a good yield – 150 gr. per plant. It takes just 8-10 weeks for flowers to start maturing indoor. Outdoor period is end September through mid October. Though SPONTANICA® Feminized marijuana was bred for outdoor cultivation, she shows excellent greenhouse and indoor performance. Her cannabis seeds are mould resistant. This strain is said to be one of the strongest strains and, yet, the easiest to clone. The buds are big and make compact shiny and sticky settings on her branches; sometimes it’s recommended to tight them up to support due to the heaviness of those highly aromatic buds. They begin spreading smooth and sweet flavour already at the end of flowering and carry on till the end. THC is said to be between 18 and 20%. 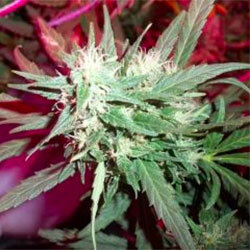 SPONTANICA® Feminized gives you a very smooth but strong effect.